« The Kinect Can Fly! 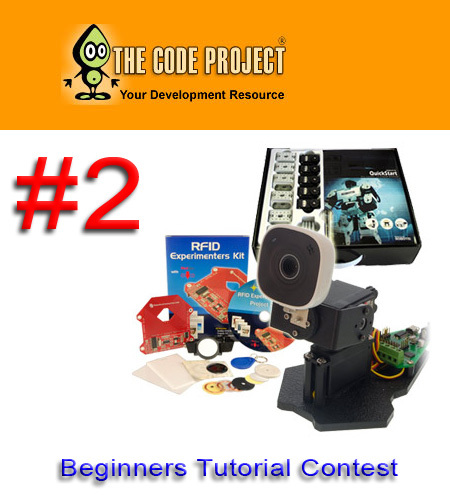 Code Project Contest – Round 2! Code Project had so much fun the first time around that they are doing it again. Up for grabs are more cool robot prizes. This time they decided to concentrate on Beginner Tutorials to help introduce people who are new to the basics of Physical Computing. This is a great chance for the robotics and physical computing community to show computer programmers what they are missing. Anyone can go join the community over there and post articles. Just please read the guidlines they have carefully first. Good luck to all who enter! The contest begins on December 6, 2010 and will end February 6, 2011 at 11:59:59 PM US Eastern Standard Time. This entry was posted on Monday, December 6th, 2010 at 12:22 pm	and is filed under Announcements, Competitions / Contests. You can follow any responses to this entry through the RSS 2.0 feed. You can leave a response, or trackback from your own site.